TAlh was created at TRIUMF as a replacement for the Motif-based EPICS alarm handler utility alh. 1. Implemented: Stand-alone application which is compatible with Alh for a superset of the alh functionality used at TRIUMF. 3. 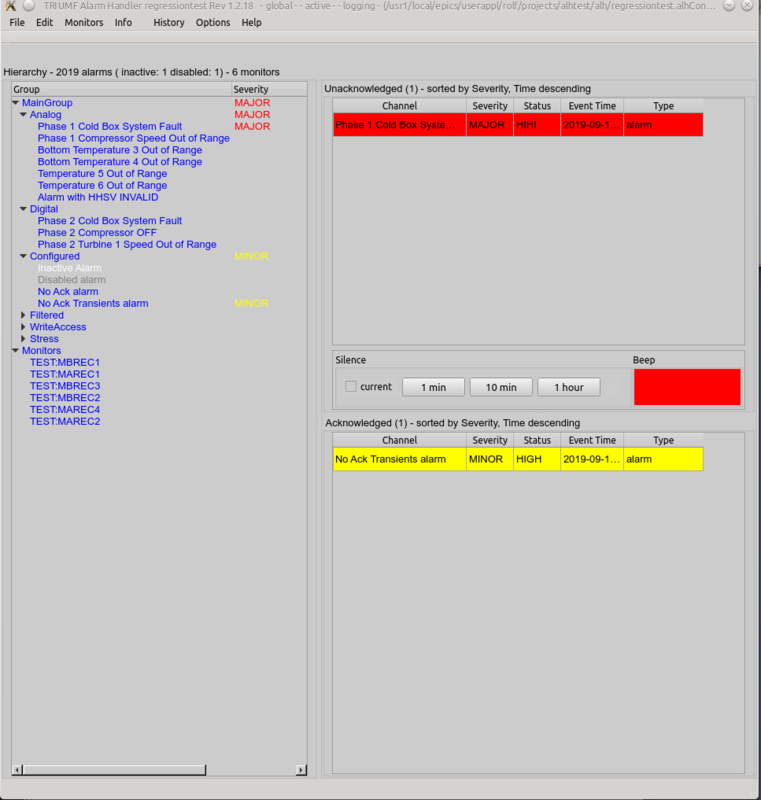 Not yet: Separation into an Alarm Handler GUI application and Alarm server. Many GUI applications allowed to connect to one Alarm server. As TAlh is intended as a plug-compatible application for Alh, the Alh documentation may be consulted to supplement the TAlh documentation. TAlh can parse alh configuration files as defined for alh 1.2.35. 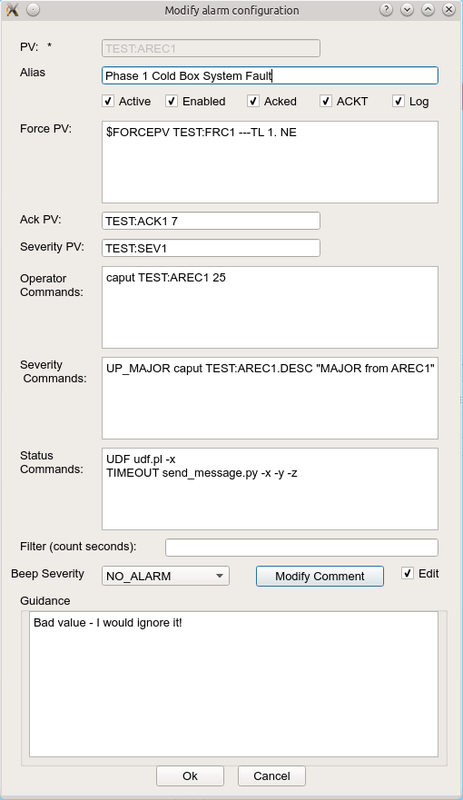 Alarm logging is implemented as a Qt plug-in. The desired plug-in and its parameters are specified with a command line switch. The TAlh distribution provides a FileAlarmLogger plugin and a PsqlAlarmLogger plug-in (for logging to a PostgreSQL relational database). At the moment TAlh does not recognize if the access rights to an alarm channel change. The left column displays the alarm hierarchy frame. The right column displays on top the unacknowledged alarm frame ("unack'd frame") and below the acknowledged alarm frame ("ack'd frame"). All configured alarms are shown in the hierarchy frame. As long as a PV is in an alarm state other than NO_ALARM it will be displayed either in the unack'd frame or the ack'd frame. In both the unack'd frame and the ack'd frame alarms are sorted by severity and event time. By default, alarms in the ack'd and unack'd frames are sorted by descending severity, and within each severity by descending event time, so that highest severity alarms are displayed on top. This default order can be changed by clicking on the column header in the respective frame. The first click sorts by the clicked column in default ascending order (sorting by event time sorts descending by default). More clicks on the same column header toggle between ascending and descending sort. A CTRL-click on any column restores the default sorting order by severity and event time. It shows a button which lists the number of unacknowledged alarms and the number of acknowledged alarms. If there are unacknowledged alarms, the button color is the color of the highest unacknowledged alarm severity (blinking). If there are no unacknowledged alarms, but acknowledged alarms in alarm state, the button color is the color of the highest acknowledged alarm severity (solid). Pressing the button restores the full display. The names of the alarms and alarm groups in the hierarchy frame are shown in different colours. Colours are listed in ascending importance, i.e. a more important colour masks a less important one. By right-clicking on a group in the hierarchy frame the run-time details of an alarm group are shown. Run-time details can be shown in a pop-up dialog or in an in-line frame below the hierarchy frame. By default, details are displayed in a pop-up dialog. The default can be changed to in-line display with the -i command line switch. The File >> Preferences dialog contains a check-box which allows the selection of in-line display or pop-up window.. The following screen-grab shows the alarm detail panel shown as a pop-up dialog. The following screen-grab shows the alarm detail panel shown as an in-line frame of the main window. In both cases the selection of a different alarm or group will refresh the open dialog, i.e. only one dialog is open at a time. CTRL-right-clicking on an alarm or alarm group opens a pop-up-dialog which shows the configuration details. the alarm guidance and alarm filter parameters can always be modified if TAlh is in global and active mode. changes to the alarm guidance are saved to file if the alarm configuration file is writable. CTRL-right-clicking on a different alarm or alarm group will open an additional pop-up-dialog so that the configuration details can be compared. If TAlh edit mode is enabled, CTRL-SHIFT-right-clicking on an alarm of alarm group opens a pop-up-dialog for editing the configuration details. When the configuration of an alarm, alarm group, or monitor are modified and accepted by pressing the Ok button, the configuration changes take effect immediately. CTRL-SHIFT-right-clicking on a different alarm or alarm group will open an additional pop-up-dialog so that the configuration details can be compared and cut/paste operations can be performed. If the check-box is shown checked, the alarm property is in the state displayed by the property label. If the check-box is shown not checked, the alarm property is in the opposite state. In the example shown in the screen-shot above, the alarm is silenced, enabled, has to be acknowledged, does not have to be acknowledged if it is transient, is beeing logged. 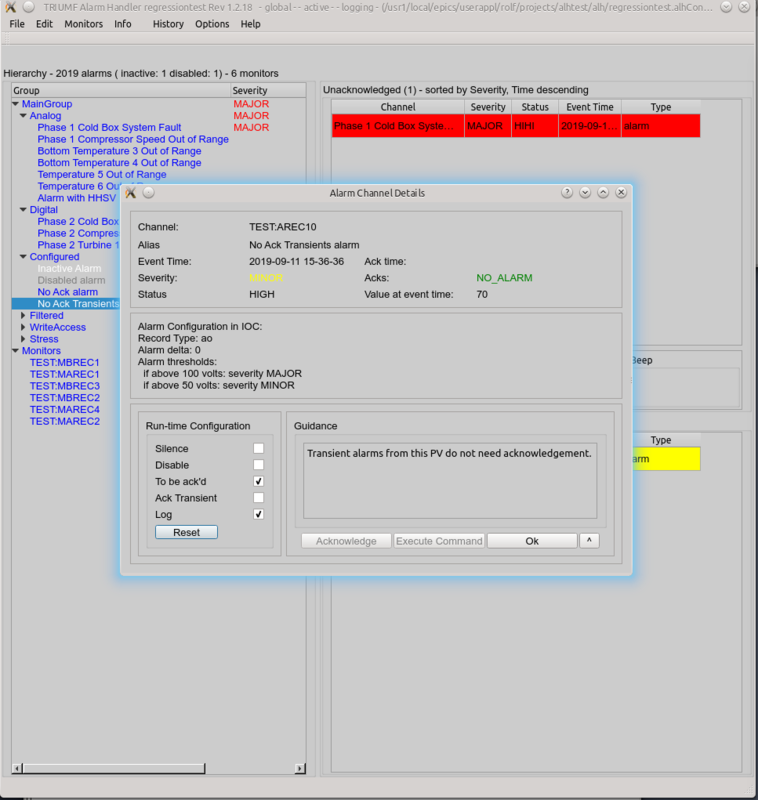 Property labels are shown with a yellow background if the alarm property is different from the configuration in the alarm configuration file, i.e. if it was reconfigured at run-time. The accoustical alarm annunciation can be suppressed ("silenced") in different ways. For silencing of individual alarms or alarm groups see the section on run-time configuration. Checking the "current" checkbox silences all alarms which are presently unacknowledged. Any new alarms which happen after the checkbox is pressed will be annunciated. Three buttons next to the checkbox allow silencing of all alarms for 1 minute, 10 minutes or 1 hour. Checking the Options >> Silence forever menu item will silence all alarms indefinitely. To indicate this state of TAlh, the main window will be displayed with magenat background and the three silence buttons will turn red. This action can be reversed by unchecking the Options >> Silence forever menu item or by pressing one of the three silence buttons. When individual alarms (or monitors) are silenced, the title of the Silence Panel changes to a yellow background and displays the number of silenced alarms and monitors. left-clicking on the title pops up a dialog which shows the silenced alarms. right-clicking on the title pops up a dialog which shows the silenced monitors. the Info menu contains items for showing the silenced alarms and silenced monitors. 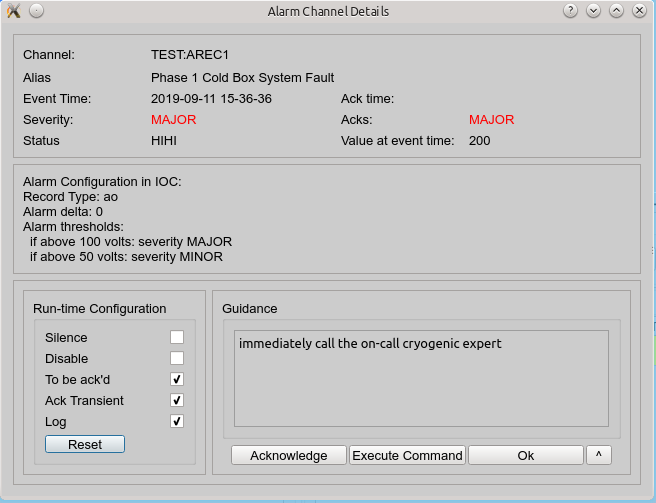 The setup of the IOC configuration for an alarm channel can be queried by right-clicking on the alarm detail display (both in-line or pop-up) outside the guidance box. This feature does only work for EPICS record types which return data of type DOUBLE or ENUMERATED. For enumerated data types bi, bo, mbbi, and mbbo records are presently supported. by the alarm operator. This configuration can be done in the configuration file or at run-time when viewing alarm details (see image below). An "ack" alarm is annunciated in the unack'd frame. When it is acknowledged it will be moved to the ack'd frame if it is still in the alarm state and disappears from there when it leaves the alarm state. A "noack" alarm is annunciated in the ack'd frame and disappears from there when it leaves the alarm state. An alarm group's alarm state is the most severe alarm state of its member alarms (and member groups, if any). Alarms are acknowledged by pressing the 'Acknowledge' button on the popup or in-line dialogs for viewing alarm details. If an alarm is configured so that no acknowledgement is needed, the 'Acknowledge' button is greyed out. Alternatively, alarms may be acknowledged by clicking on an alarm in the unack'd frame with the middle mouse button. Acknowledging an alarm group will acknowledge all unacknowledged member alarms including alarms in member alarm groups. 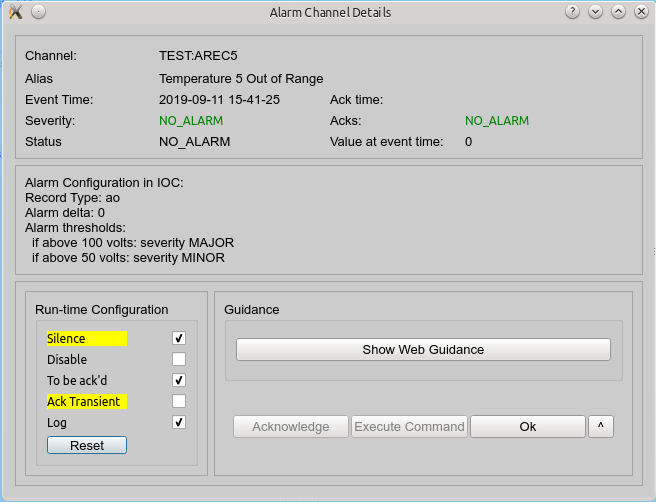 Like alarms, alarms groups are acknowledged by pressing the 'Acknowledge' button on the popup or in-line dialogs for viewing run-time details. If an alarm group is configured so that no acknowledgement is needed, the 'Acknowledge' button is greyed out. By default TAlh allows acknowledging of alarm groups. This behaviour is configurable. If the alarm configuration file contains the keyword $NOACKGROUPS acknowledging of alarm groups is disabled. This setting cannot be overridden. If the alarm configuration file does not contain the keyword $NOACKGROUPS acknowledging of alarm groups is by default enabled. This default behaviour can be overridden on the command line by setting the switch --noackgroup. If the command line does not contain the --noackgroup switch, the default behaviour can further be modified in the Help >> Preferences dialog. Monitors, aka "Channel Watchers" are special alarms which are configured interactively via the Monitors menu. They do not need any PV configuration in the IOC. Monitor properties can always be modified at run-time. Monitors are saved to a monitor configuration file and survive a TAlh restart if TAlh has write access to the configuration directory (the directory from which the alarm configuration file is loaded). an alarm can be silenced, i.e. sound annunciation for the alarm is suppressed. an alarm can be disabled, i.e. the alarm will be ignored by the alarm handler. an alarm can be set "Ack Transient", i.e. it must be acknowledged by the operator, even if the alarm condition is not present any more. The reset button will revert all properties to the configuration file values. $BEEPPV <analog PV name> If present and there are any unacknowledged alarms, TAlh will write the highest unacknowledged alarm severity to this PV every time an annunciation beep is happening. This can be used to drive one or more alarm anunciations out of an IOC. $END This keyword allows the addition of comment blocks to alarms or alarm groups. Comment blocks and guidance blocks must not overlap. shows a set of mask bits for the group, where a bit is set if at least one of the group's children has this bit set, i.e. if one alarm in the group is disabled, the group mask will have the 'D' bit set. allows global silencing of all alarms for a selectable period or silencing of the current alarm. shows the alarm group as disabled only if it was disabled by the operator, or if all children in the group are disabled. allows global silencing of all alarms for a selectable period, silencing of the current alarm or silencing an individual alarm, monitor or alarm group. if the inputCount is reached again --> alarm goes into alarm again. alarm stays in alarm unless the PV stays out of alarm for > inputSeconds.